Writing Task 1 In Ielts. Topic: the chart shows the percentage of female members of parliament in 5 European countries from 2000 to 2012. 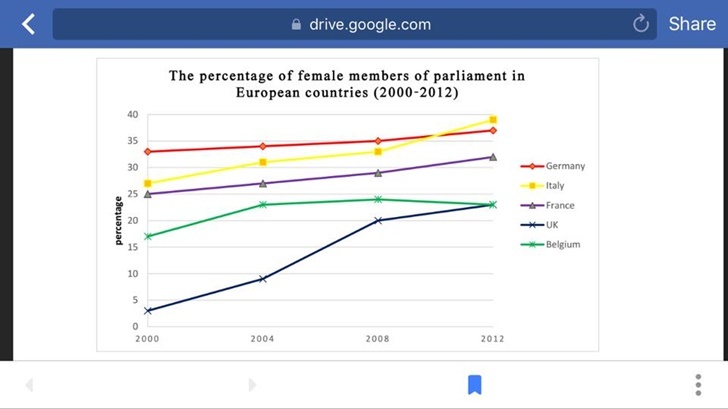 The graph illustrates the proportion of parliament's female joiners in European countries between 2000 and 2012. It can be seen that there was an upward trend in the percentage of female members in 5 countries. However, while there was a significant change in the figure for the UK , the figure for Germany and France almost remained stable. From 2000 to 2008, the proportion of female joiners of parliament in the UK boomed rapidly from just below 5% to 20% before continuing to increase to just under a quarter in 2012. Nevertheless, the figure for France went up gradually from 25% to well over 30% between 2000 and 2008. The same pattern can be found in the figure for Germany with just over one in three at the end of the period shown. Standing at approximately a quarter, the proportion of parliament's female members in Italy climed to roughly 40% in 2012. The figure for Italy in 2012 was the highest during 12 years compared to other countries. By contrast, rising from about 17% in 2000 to nearly one in four in 2012, the percentage of female joiners almost levelled out before dipping to well over 20% in 2012. The graph illustrates the proportion of parliament's female joiners (Completely unnatural. People to not submit a job application to Parliament and get hired by the government. "Joiner" is primarily used in Indian English, and expresses the process of being hired by a company. We don't use it at all in American English, except in a different context. "He's a joiner." means that he likes to join lots of social groups. ) in European countries between 2000 and 2012. It can be seen that There was an upward trend in the percentage of female members in (You need a determiner here.) 5 countries. However, while there was a significant change in the figure for the UK , the figure (Is there one combined number for both Germany and France?) for Germany and France almost remained stable. From 2000 to 2008, the proportion of female joiners of parliament in the UK boomed (Too informal for an essay.) rapidly from just below 5% to 20% before continuing to increase to just under a quarter in 2012. Nevertheless, the figure for France went up gradually from 25% to well over 30% between 2000 and 2008. The same pattern can be found in the figure for Germany with just over one in three at the end of the period shown. Standing (Standing is used for static situations) at approximately a quarter, the proportion of parliament's female members in Italy climed to roughly 40% in 2012. The figure for Italy in 2012 was the highest during 12 years (It was not higher in 2004!) compared to other countries. By contrast, rising from about 17% (for Italy?) in 2000 to nearly one in four in 2012, the percentage of female joiners almost levelled out before dipping to well over 20% (Dipping and over do not go together. ) in 2012. Essays should be posted here in our Essay Writing forum, not in our Grammar forum. Freedom Of Artists- Ielts Task 2? IELTS WRITING TASK 1 - Money Spent On Books?